FirstLight Named “Best Home Care Agency” in the South Sound Again! 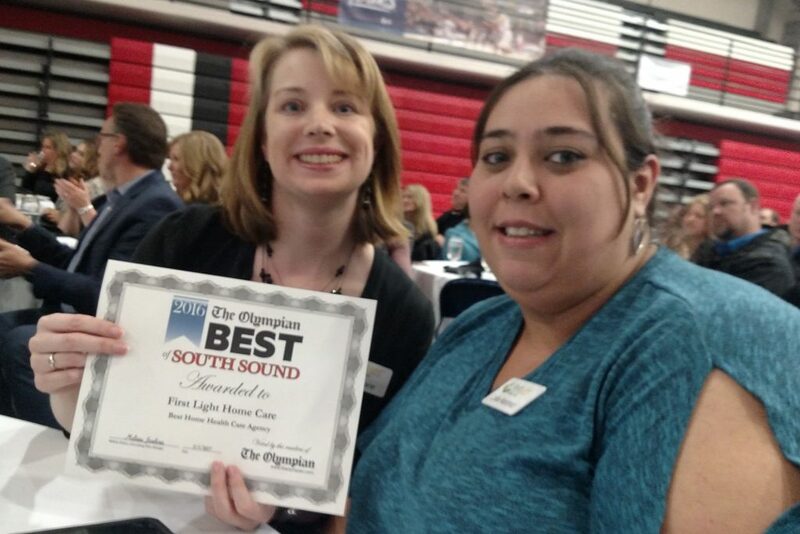 FirstLight Home Care has again been voted “Best Home Health Care Agency” in the annual Best of South Sound contest. Sarah and Greg Lane, co-owners of FirstLight Home Care – South Sound, accepted the award at the 2016 Best of South Sound ceremony, sponsored by the Thurston County Chamber and The Olympian. Sarah Lane said they were grateful to be voted “Best Home Health Care Agency” for the second straight year. The Olympian has recognized Thurston County businesses with the popular Best of South Sound awards for over a decade. Readers vote online for their favorite local businesses in over 80 categories. FirstLight Home Care – South Sound was voted “Best Home Health Care Agency” in both 2015 and 2016. Earlier this year, FirstLight Home Care – South Sound also received both the Best of Home Care Provider of Choice and the Best of Home Care Employer of Choice awards from Home Care Pulse, the leading independent quality-satisfaction firm in the home care industry. FirstLight is the only home care agency in Thurston County to receive either award.